Dominic is a big (85 lbs.) 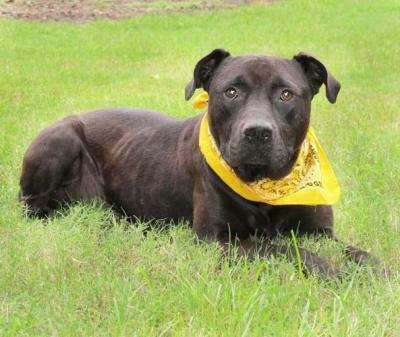 beautiful black Lab/Am Staff mix who is a little over three years old. He came to the shelter as a stray, so his past is a mystery. 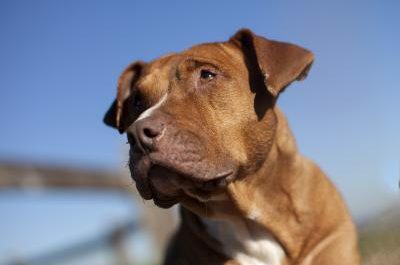 Dominic is a very shy guy who seems to like other dogs that let him shadow their confidence. He is a little uncertain of people (I know how you feel buddy), most likely because he was never socialized with them when he was little. In his foster home, Dominic is learning to trust, gaining confidence, learning about walking on a leash, and hanging out with the girl dog in the house. If you would like more information about Dominic or want to set up a meet and greet with his foster family, please email me at afureverfamily@yahoo.com.